Takashi Nagai was a physician specializing in radiology, a convert to Roman Catholicism, and a survivor of the atomic bombing of Nagasaki. 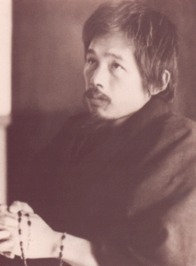 His subsequent life of prayer and service earned him the affectionate title "saint of Urakami". “In a flash I had a change of heart. Even one precious life was worth saving. Japan was defeated; but the wounded were still alive. The war was over; but the work of our relief team remained. Our country was destroyed; but medical science still existed. Wasn't our work only beginning? Irrespective of the rise and fall of our country, wasn't our main duty to attend to the life and death of each single person? the very basis of the Red Cross was to attend to the wounded, be they friend or foe. Precisely because we Japanese had treated human life so simply and so carelessly--precisely for this reason we were reduced to our present miserable plight. Respect for the life of every person--this must be the foundation stone on which we would built a new society. “We were members of a research group with a great interest in nuclear physics and totally devoted to this branch of science--and ironically we ourselves had become victims of th atom bomb which was the very core of the theory we were studying. Here we lay, helpless in a dugout!